Are your gutter spilling over because they are blocked? Are rain gutter downspouts dumping large volumes of water in that area? Is there a low point on the ground that allows water to build up in that area? Is the outside ground surface pitched towards this area? Is the outside surface soil level higher than the top of the foundation? Is there a deck or porch outside in the problem area? 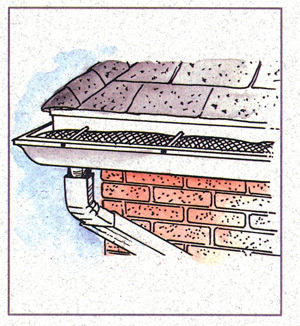 Clogged Rain Gutters - Make sure your rain gutters are clean and working properly. Clogged rain gutters will dump large amounts of water directly alongside your foundation. You should have them cleaned twice a year, especially after all the leaves have fallen before winter. Gutter guards to keep leaves out of your rain gutters is also a good idea. Down Spouts - Make sure your downspouts have watertight fittings and are extended at least 10 or 15 feet away from your home. They should empty out onto land that is sloped away from your home. 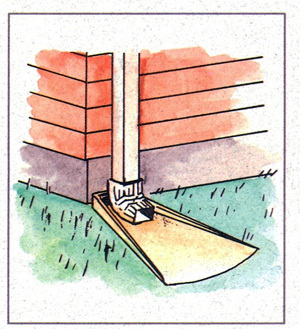 Do not bury downspouts underground and connect to a dry well. Dry wells fill up quickly and cause your gutters to spill large volumes of water directly against your home. If you run underground pipes to take rain gutter water away, make sure you have a good pitch for gravity flow and let them empty out over a slope, to “daylight”. Always make sure the end of the pipe is visible. Use a free-flowing screen or back flow valve to keep small animals out. Make sure leaves, pine needles, etc do not accumulate inside the screened end of the pipe. Low Spots Near Foundation – Sometimes the original backfill has settled down along the foundation, leaving low spots for water to accumulate. Fill in these areas with top soil and plant grass to prevent erosion. Pitch the surface away from your home. Do not fill in dirt higher than the top of your foundation walls. This can create new problems. Yard Pitched Towards the Home – When the ground surface level pitch towards the home, all the rain water from your whole yard is concentrated along your foundation. This can cause water to spill over your foundation between the sill plates. It also makes the soil alongside your foundation wet and heavy. 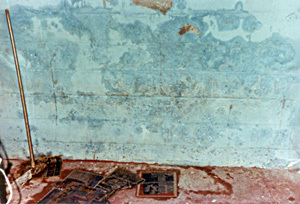 This condition can lead to buckling walls. Remedy - Hire a landscaper to re-grade the surface to pitch away from your home. Sometimes this can be difficult because of varying factors and a swale is the answer. A swale is like a dry creek. Your yard is slightly contoured lower, between your home and the sloping area. The lower area, a swale, is contoured to drain surface water around your property and to drain where the water won’t cause further problems. Outside Soil Level is Higher than the Top of Foundation – This situation not only causes water problems but also, invites insect problems. When soil gets in close contact with wood, water and insects have a direct pathway to your home. Wood rot is yet another concern. Most building codes prohibit this practice but, it is none the less, a common problem. Remedy - This problem will involve hiring a professional landscaping contractor to lower the grade level near your home and direct the surface water to run away from your home or around your home. Sometimes, a swale has to be created to effectively cause the surface water to flow the way that you want it to. Decks and Porches – If your water problem inside, is in the same area as your deck, chances are the deck wasn’t flashed properly with the homes siding. When there isn’t proper flashing, water can run over the deck surface boards and then, over the sill plate on top of your foundation. This can also create wood rot and insect problems. Remedy - You will need a siding contractor to remove a couple courses of your siding and probably remove the deck boards touching your homes walls. Once proper flashing is installed, he can replace the siding and deck boards.